Amazon has an Adorable Vintage Seahorse Necklace for $0.99 shipped!I can't wait to add the great necklace to my collection and the price is simply unbeatable. Material:Zinc Alloy. Condition:100% Brand new. 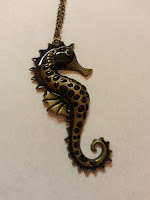 Chain length:51-80cm(adjustable).Large 3" Seahorse pendant. Weight:21g. Brass-colored metal and Black enamel seahorse shape. Great sweater necklace. Also a nice gift idea for seahorse lovers.